Right from the outset it felt like we were rowing well, a solid paddle to the marshalling area was followed by just about our best row down to the start which we have had. The practice starts were as near to perfect as we could realistically hope for, so we arrived at the start full of confidence that we could finish the job quickly. Unlike yesterday, today we had a crew chasing us, though we were fairly sure that Selwyn wouldn’t be giving us too much trouble from behind given that we bumped them yesterday. However, off the start they appeared to gain a little on us, though their whistles were very optimistic! Once we had completed our full start sequence, we were absolutely flying, and by the motorway bridge we were getting two whistles on Emmanuel ahead of us, and Selwyn had fallen way back behind us. It was far choppier than it had been yesterday, but we held it together well and powered through Emma’s wash to hit them just coming into first post corner. A very efficient bump today, and with Catz continuing to go up in front of us, there are plenty of slow crews being sent our way for the rest of the week. After a comfortable row over at the head of division two, we were rewarded with the opportunity to bump back into division one. The four boats in front of us were likely to form a sandwich as the race progressed; therefore it was essential that we took out Selwyn as quickly as possible. The row down was calm – we all knew what we had to do and believed we could achieve it. As we were pushed out silence gripped us – square, locked, and buried in the water; ready. Gun. Our start saw us moving well, heading into the wash of the 17 boats ahead of us. As we exited the first corner, lining up for the motorway bridge, we got our first whistle. One length. Focusing on holding the finishes through, we held our speed through the rough water under the bridge and from the outflow. With the worst of the water behind us we made our move. We lifted up onto a rhythm that had us rapidly closing on Selwyn. Two whistles – Half a length. As we approached First Post Corner I became aware that Selwyn were closing on St Catz, who were closing on Emmanuel, who were also closing on Magdalene – it was going to be tight. Three whistles – A canvas. The Selwyn cox had taken a nice tight line into First Post Corner, so I took one even tighter – blades just brushing the bank. Continuous whistles – Overlap. On the apex of the corner our bow-ball was almost level with their seven-man and the bump was given. King’s were back in the First Division. After a swift bump on Day 1 of Lents, M2 was full of confidence for a Day 2 in blazing sunshine. Some first day nerves were provided by Becca however, who had taken back her place in the cox’s seat after Ivan’s stand-in, and some wiring problems which caused some alarming sounds from the coxbox, that unfortunately didn’t allow her lovely voice to reach the entire boat. A harder row was expected having FaT III in front, a worthier challenge than Girton II from the day before. Gunshot! After a slightly scrappy second draw stroke, seven strong winds allowed for a solid start, catching up with FaT III who had started quicker. The crew settled into a good rhythm, keeping pace although not continuing to gain on the opponents. Pushing hard the crew managed to sustain a distance of about a length and a half on FaT for the first half of the course. However, a while after the river had cleared up behind them, with Jesus III bumping Girton II behind, FaT III managed to pull away some lengths over the Plough Reach. Still going for the bump, the crew continued on rowing hard for the whole rest of the race, although FaT III was now out of reach. With nothing ahead to bump, we knew that we were going out for the row over. However, at the head of the division, we had nothing but clear water to enjoy. Our plan was to push Downing II away off the start and settle into our cruising rhythm. Our start was fast, winding up into the mid 40s and settling around 38-39 after the full start sequence. Downing II were already falling away by this point so the crew began to relax. Will got momentarily worried when the rate started to drop off past the Plough, but was relieved when he turned around and saw that this was only because the crew had seen how far ahead we were. Nevertheless, we lifted up coming onto the reach just to guarantee safety, and the crew hit an awesome rhythm. Having safely seen off any competition, particularly after Fitz caught Downing, we settled down onto a comfortable rate 32, and then a slightly uncomfortable rate 28 after nagging from the bank, to take us over the line and towards the first division the next day. The atmosphere in the boat was tense. For six of our crew this was the first Bumps and no one really knew what to expect. In front of us was Girton M2 – a boat that earned blades last year but who’s crew were looking slow in their recent races on the Cam. Chasing us, Lady Margaret M3, who we were sure we could hold off. Starting at station 12, we were in a perfect position to hold a straight racing line up to the motorway bridge and hopefully gain quickly on the boat in front. Confidence was high. As the starting cannon fired, all pre-race nerves fled and we executed one of the cleanest starts we’ve ever achieved (this is a relative measure – so still not perfect). The first phase of the race went exactly to plan and we gained rapidly on Girton from the start. As we settled down into our pace, whistles were coming quickly – but so were Lady Margaret. Staying focused; we kept driving forward and made consistent ground, reeling in the meters between us and Girton, successfully bumping just past the motorway bridge. A great first day and a very short race for King’s M2! This was it; one race to decide whether you have a future in bumps. Was M3 ready? The row up to the start saw some stylish steady state interspersed with enthusiastic high rate work. While marshalling, spirits were high. Songs were sung, speeches were made and the time had come. After winding before the start, M3 drifted across the line and found a composed rhythm. Occasionally, members of the crew got a little carried away and went searching for their own rhythm. Generally, it was a good looking row with at least most of the oars doing the same thing. When they crossed the line, some had even broken a sweat. But alas, later that evening it was announced that they had not made the cut. With more power and training, M3 could do well in Mays where they already have a secure position. The final of Pembroke regatta effectively came in the first round. King’s M1 squared up against Caius. Off the start, it was all pretty level with King’s up by a seat at best. Caius pushed into the first corner and came out a few seats up. The next corner favoured King’s and those seats were clawed back. Unfortunately coming out of the last corner Caius put in a burst and pulled away. They crossed the line with an official margin of 3/4 length. A solid row but not a victorious one. The river was still, the sun was bright and the stage was set. M3 were the first crew to race on the men’s side and they faced the mighty FaT M5. Attention. Go! For a moment, it was unclear whether either crew had was actually moving as torrents of water were flung everywhere. As the mist cleared, King’s were had edged into an early lead. By the first corner they had clear water and went on the win “easily”. Round two; Caius M3. Moral was as high as ever, but this would be no push over. The start was slightly more composed than the previous race but Caius were half a length up off the start. King’s held it in contention until after the spectators had seen them where Caius pushed on to a comfortable victory. Not a bad row by the spirited M3, but still a long way to go before any silverware adorns their mantels. As usual, this competition, coming so close to bumps, was an excellent opportunity to sort out standing starts and get a good look at the competition. This was especially key for the King’s girls as their first draw was against the crew directly behind them on the first day: Magdelene. Fortunately, the jitters of the side-by-side race failed to throw the girls and we managed to pull away fairly immediately, eventually beating them by a good length or two. Christ’s had just had surprise success against the Caius women. Whether it was confidence from this victory that fueled them or simply superior technique, this crew managed to pull away in the same manner as we had in the previous race and unfortunately it was we who were left trailing by the finish line. However, the girls were not disconsolate by this defeat as it allowed us an early exit from the river in freezing conditions. The crew has gone from strength to strength on the final weeks leading up to bumps and hopefully this will anticipate good results when it comes to the Lent competitions. We were feeling extremely confident in the run-up to the regatta, as we had been doing lots of work on our standing starts and had a calm, powerful start under our belt, which we knew would count for a lot in a side-by-side sprint such as this. Rowing up we did a fantastic practice start, just as relaxed as those in training. As we were up against Jesus W3 we were not too nervous about how the race would go. Before the start the Marshals insisted that they give the calls to bow pair for straightening up, but weren’t very successful at doing so – as we set off they began whistling immediately at us for encroaching, which was quite distracting. The start itself was not as good as the practice one, being more rushed, but everyone was still together and getting their blades in, and we soon began to pull away from Jesus. This helped us relax and we were just getting into a solid rhythm that would have won us the race easily when disaster struck – the rudder cord snapped. Tim our cox tried desperately to keep us straight but there was nothing to be done, and we had to hold it up before we crashed into the bank, leaving Jesus free to overtake and get the win they did not deserve, and us extremely disappointed. Unfortunately, the conditions at Bedford this time around were not so favorable and the whole day saw continual rain, which left everybody cold and wet. Despite this, the girls were in high spirits and the assembling and disassembling of the boat was easier this time around due to the experience of the Michaelmas race. 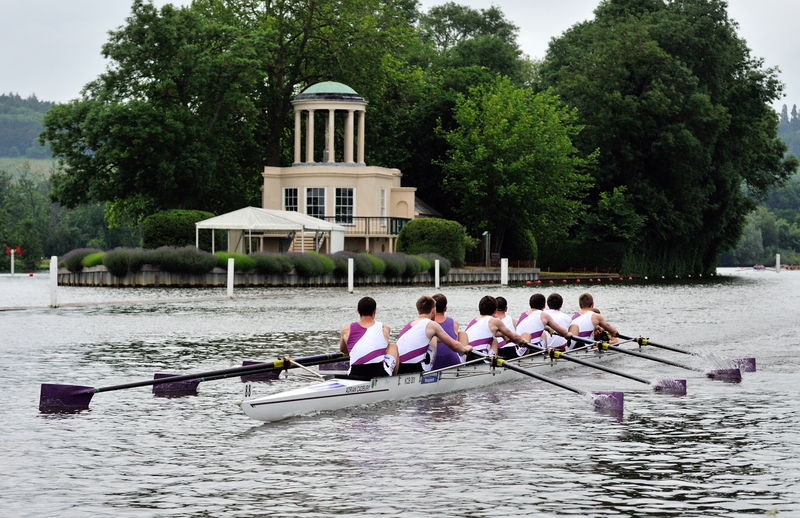 Unlike the last Bedford experience, many of the best Cambridge colleges also ventured off –cam to test their mettle in new waters. 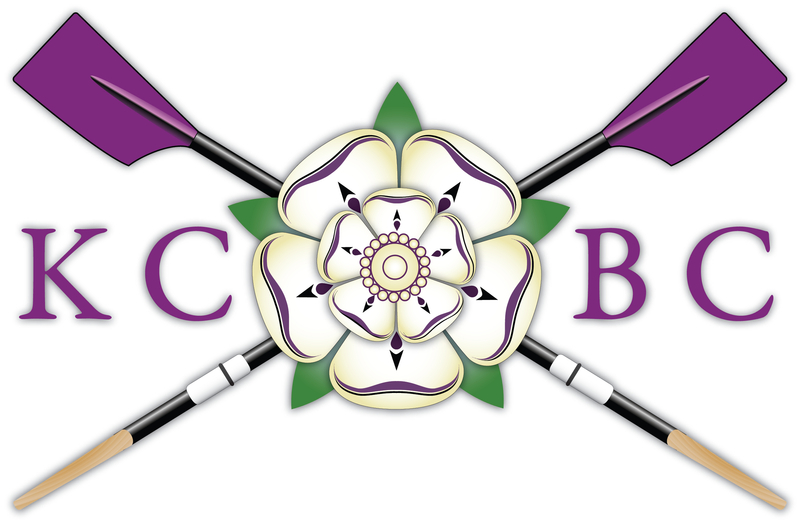 Considering this, we did incredibly well to come 5th out of the women’s 8’s, well among the best of them with a time that equaled our personal best, forged at Bedford the last time. This was the first test for the young M3. All of the crew are former novices and nervousness was rife; especially amongst the bank party. After a brief team talk they were rowing focused, relaxed and almost well to the start. They wound the rate up comfortably before the start and they were underway. Battling to overcome the slow flow of the Cam, they made it out onto the reach. Despite a relatively low rate, some were practicing their rowing faces for the getting on race; their next race and aim for the term. By the railway bridge they were flagging but, amazingly, they were still rowing well! The boat remained almost sat and more strokes than not were in time. Nevertheless, crossing the line with no crabs or mishaps was a relief to all. They came 2nd out of the crews needing to get on; a very promising result. On a Friday afternoon Kings W3 rowed down for their first head race of Lents. W3 went off at a steady pace, with the wisdom that everything is easier and life is a lot nicer at a lower rating. The boat was sat and the race was comfortable, no crabs and no scary moments. The results did not do their effort justice as there were no other W3s in the race but it was a good effort from all of the girls. Well into our stride by this point in term, the girls rose to the challenge of this 2k with confidence and enthusiasm. This distance suits our crew very well as it gave us time to settle into the strong rhythm that we have been working on over the winter and pull back from any dips in power that inevitably occur. The result; 4th out of the 16 college crews proved our worth and we were pleased to see that we came out above some of the oldest rivals. This first race for W2 was a controlled, tidy row that we were pleasantly surprised with. Although we were definitely putting down power we could have been more aggressive, but a time of 09:32 achieved cleanly is a solid base to build on. 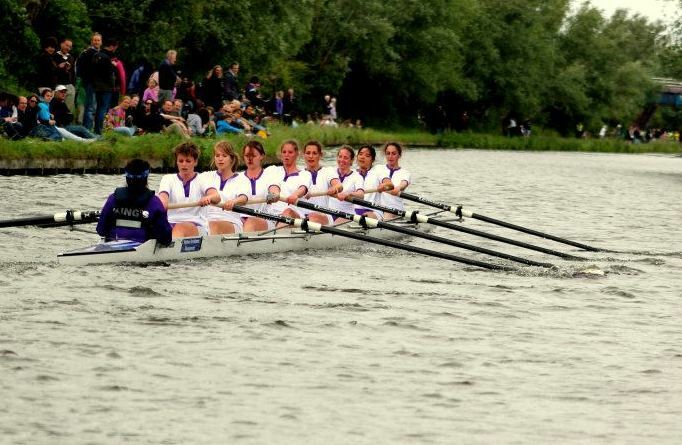 We hope to improve the time when we row the same course in the Getting on Race, to secure our place in the Lent Bumps.